Following the smashing success of "Last Horizons" (SMP, 1989), Peter Capstick now presents a second volume of pieces culled from such magazines as "Outdoor Life," NRA's "American Hunter," "Guns en Ammo," and "Petersen's Hunting," The articles showcase a literary style that prompted "Kirkus Reviews" to say of "Last Horizons," "No one since Hemingway (with the possible exception of Ruark) has written on these subjects with such literary gusto." The stockbroker-turned-outdoorsman recalls his days as an African pro hunter in "The Killer Baboons of Vlackfontein." "Four Fangs in a Treetop" records a foray into British Honduras for the jaguar, "a gold-dappled teardrop of motion." 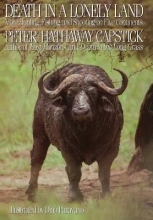 Capstick narrowly escapes the Yellow Beard, Central America's deadly tree-climbing snake, and cows "The Black Death (Cape buffalo) in the kind of article that makes this author "the guru of American hunting fans" ("New York Newsday"). On Brazil's forsaken Marajo Island, he bags the pugnacious red buffalo, which has the "temperament of a constipated Sumo wrestler and the tenacity of an IRS man." The author discusses 12- and 20-gauge shotgun loads; recalls the pleasures of "biltong" (African beef jerky); describes the irresistible homemade lures of snook fishing expert John Gorbatch; and kills a genteel take of Atlantic salmon with the brilliantly simple tube fly. Over thirty gorgeous drawings by famous wildlife artist Dino Paravano make this volume yet another collector's item by a writer who "keeps the tradition of great safari adventure alive in each of his books" ("African Expedition Gazette"). Peter Capstick's eight prior titles include "The Last Ivory Hunter" (SMP, 1988); "Peter Capstick's Africa"(SMP, 1987); and "Death in the Long Grass" (SMP, 1978). Shotgun Pellets: Is Bigger Better?